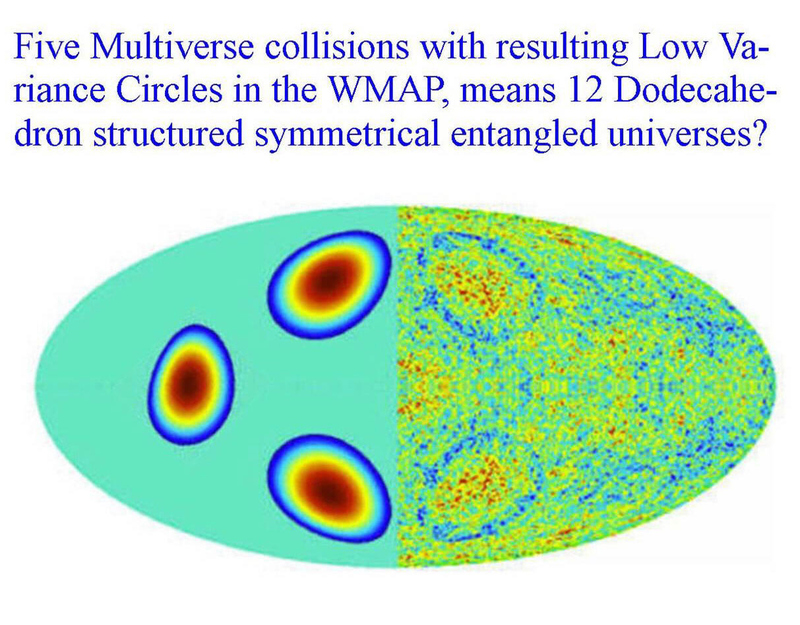 Five (instead of four) Multiverse collisions with resulting Low Variance Circles in the WMAP, means 12 Dodecahedron structured symmetrical entangled universes! Five (instead of four) cyclic Multiverse collisions with resulting Low Variance Circles in the WMAP, means 12 Dodecahedron structured symmetrical entangled universes! 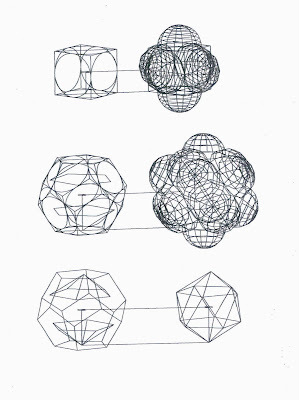 See: A Grand Design for an entangled 12 fold symmetric dodecahedron Multiverse in raspberry shape. First Observational Tests of Eternal Inflation. By; Stephen M. Feeney,1, _ Matthew C. Johnson,2, 3, y Daniel J. Mortlock,4, z and Hiranya V. Peiri. 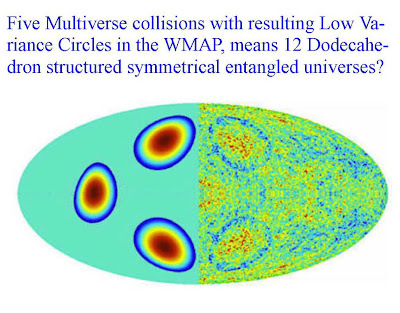 "We present the first observational search for the effects of bubble collisions, using cosmic microwave background data from the WMAP satellite. 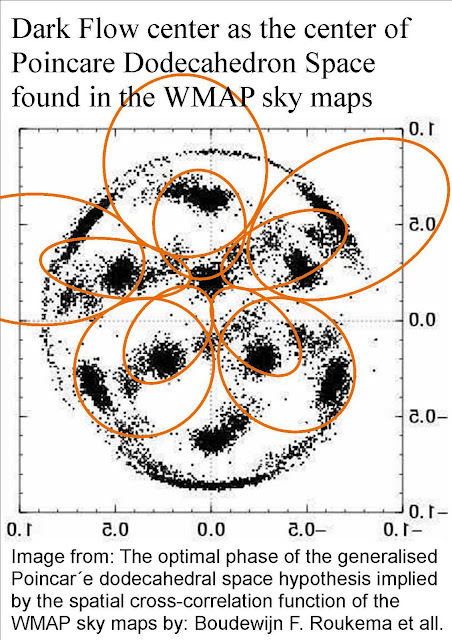 Using a modular algorithm that is designed to avoid a posteriori selection effects, we found four features on the CMB sky that are consistent with being bubble collisions. If this evidence is corroborated by upcoming data from the Planck satellite, we will be able to gain insight into the possible existence of the Multiverse." Alternative Standard Model of single geometrical particles able to form Compound "click-on" Quarks and Leptons, has huge impact on NEW Black Hole physics. 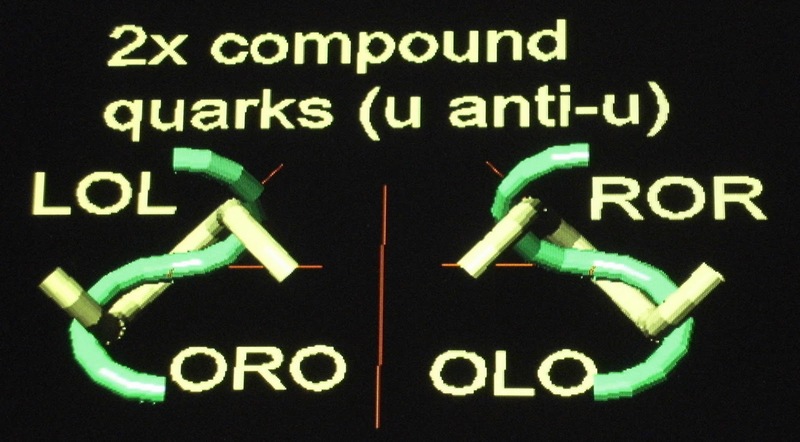 Examples of click-on compound quarks. 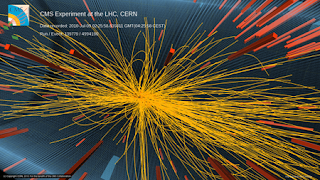 that inside a Electron-Positron-Gluon plasma as is predicted to be present in the Big bang, only a very small part of the Fermions will annihilate into radiation. However the vacuum itself should have CHIRAL PROPERTIES, to prefer electrons above positrons to survive as single particlkes, in this particle click-on process. The rest of the Electrons and Positrons will form a Quark Gluon plasma, see below. This process is supposed to be originated by the peculiar Fermion repelling Black Hole globular horizon. 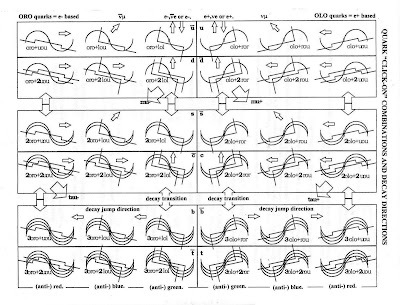 The BH horizon is assumed to be able to repell Fermions by the "SPIN FLIP" of fermions induced by the extreme local structure of the dense oscillating Higgs vacuum lattice called "warped space" or space warping. 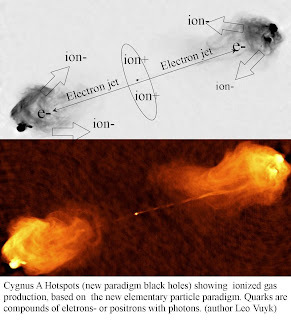 CONCLUSION: Fermions (gas and dust) are mainly pushed away from the black hole by the Spin Flip induced by the local vacuum structure of the horizon. 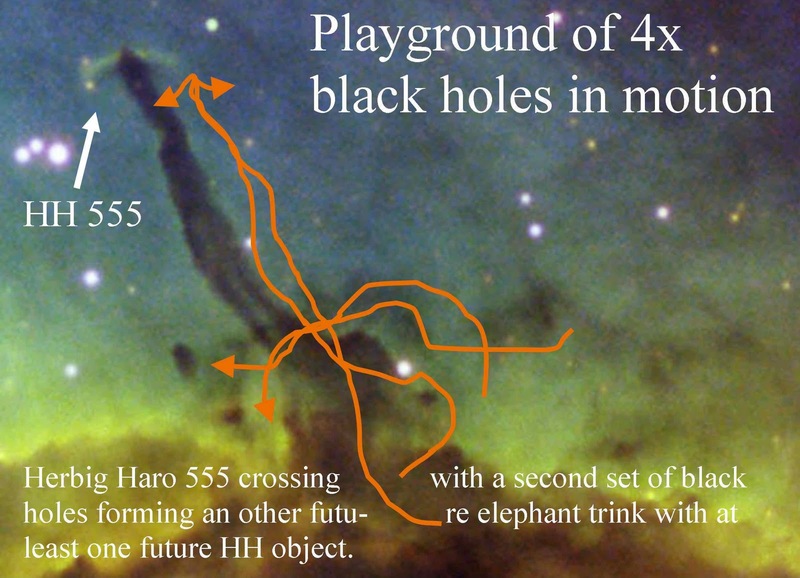 Only the vacuum itself and radiation is able to pass through and feed the black hole. 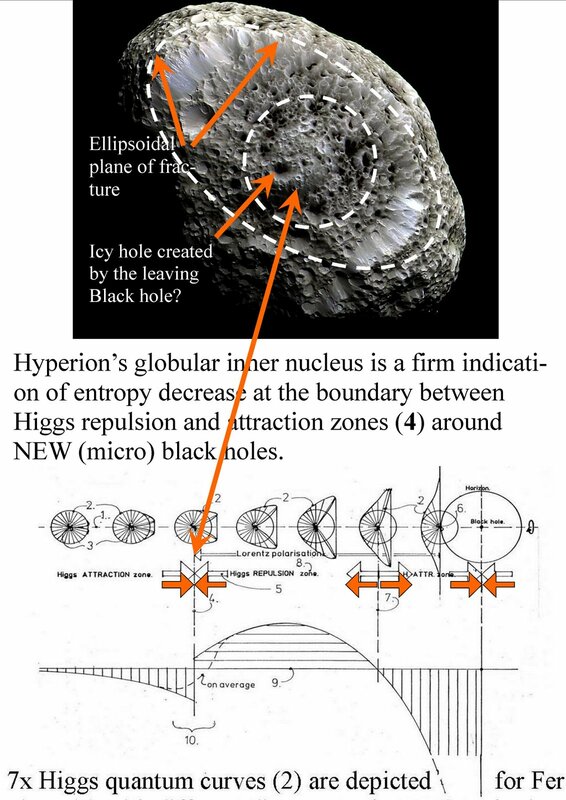 Fermions are pushed away from the black hole by the so coined Higgs repulsion zone. 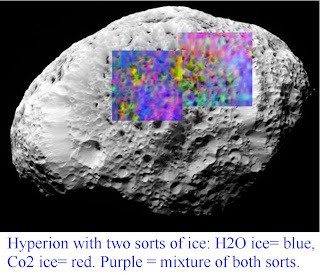 at their Fermion repelling globular horizon. 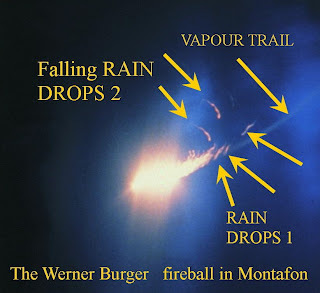 The reported "hovering against- or with the wind" can be easily explained by the Plasma tail hypothesis: the plasma production can be more or less than a critical amount to withstand the wind force. 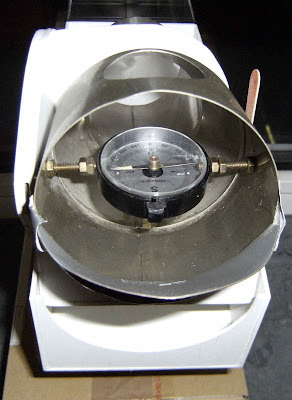 An interesting example of free energy, a-symmetrical vacuum energy or a-symmetrical macroscopic Casimir effect. 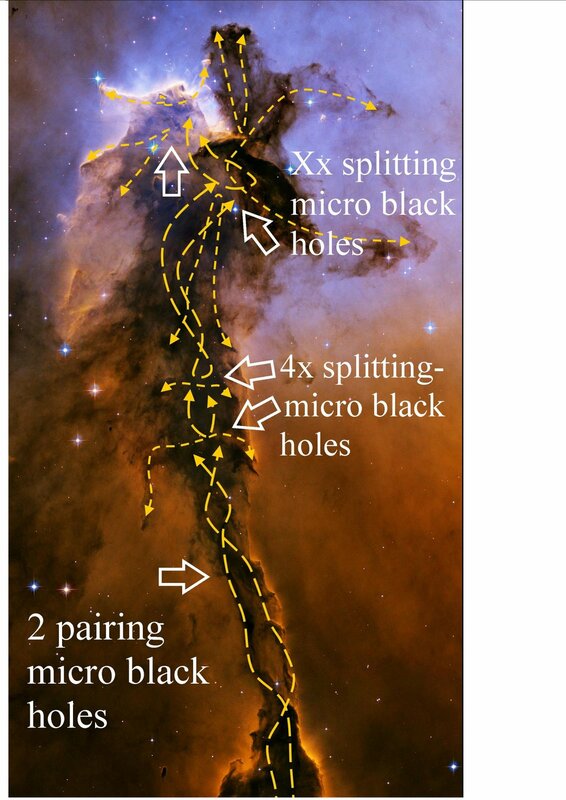 THE EAGLE NEBULA is the most obvious example of splitting and pairing micro black holes. 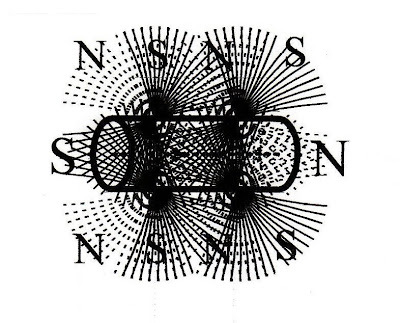 A GREAT basic example for universal complexity. 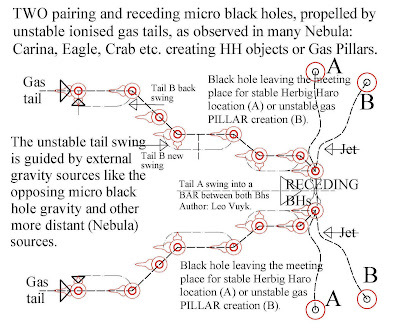 How could we explain the propulsion of ball lightning-or other (Nebula) black holes? 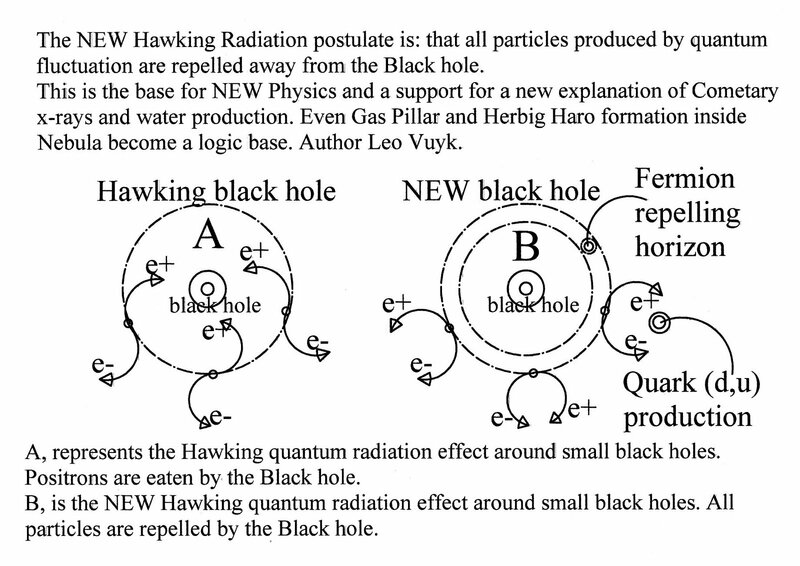 1: Fermions are repelled by the black hole horizon. 2: This horizon is also the origin of gas/plasma production. 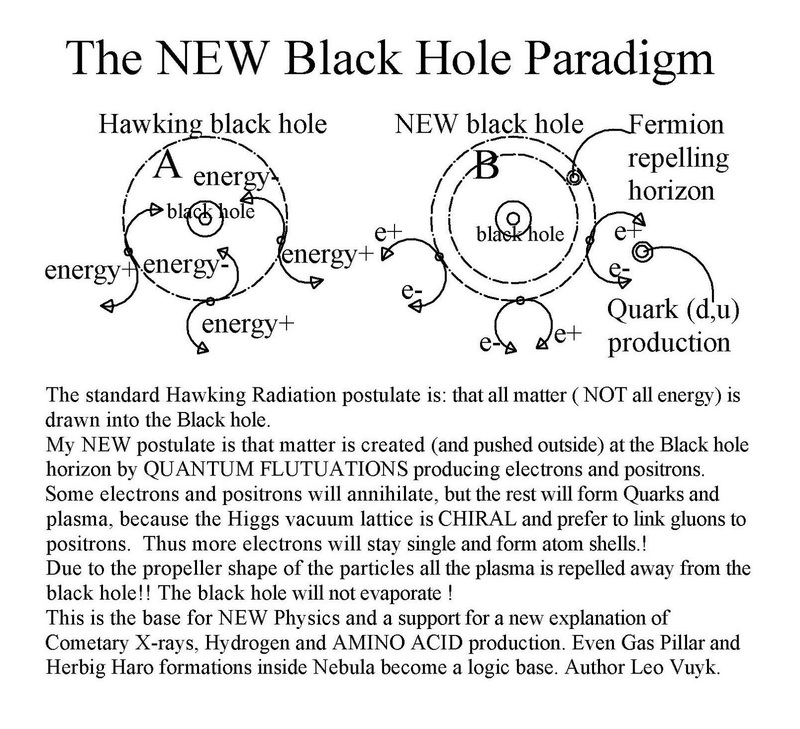 3: The oscillating Higgs vacuum particles (pushing fermions around) are absorbed by the black hole. 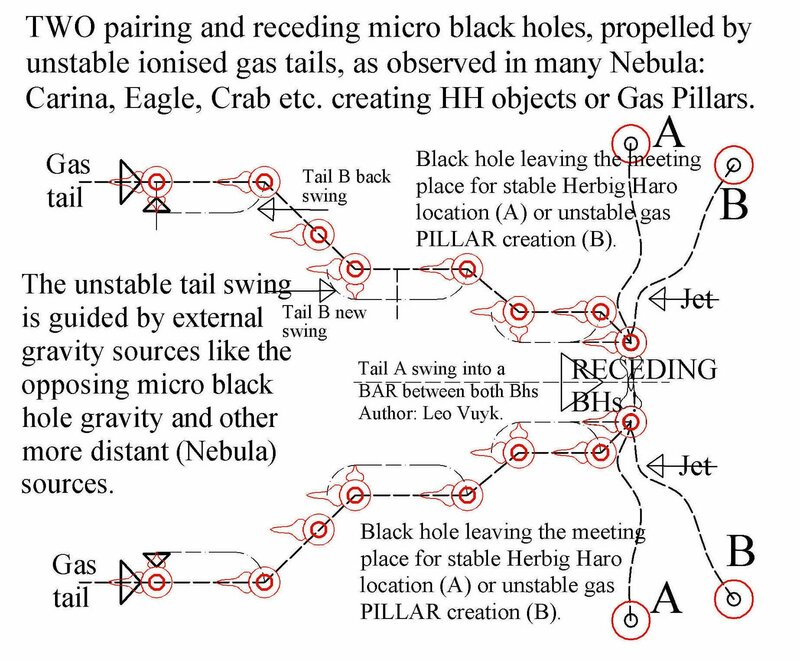 The result is that gas tails will push the black hole through the vacuum away from gravity sources (or against wind influences like the ball lightning example, see before). 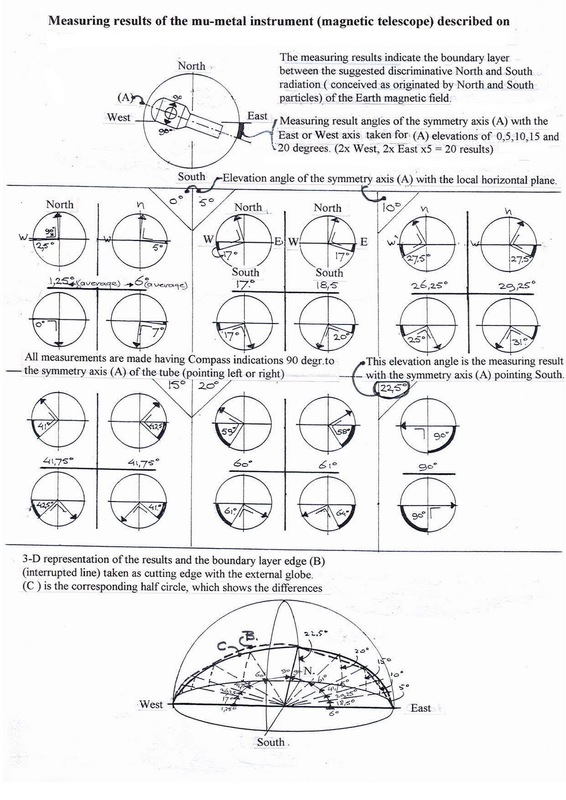 See also: "MASSLESS Higgs and Massless Black Holes with macroscopic Casimir gravity, or double LeSage gravity"
Non-geometric Fluxes, Asymmetric Strings and Nonassociative Geometry. 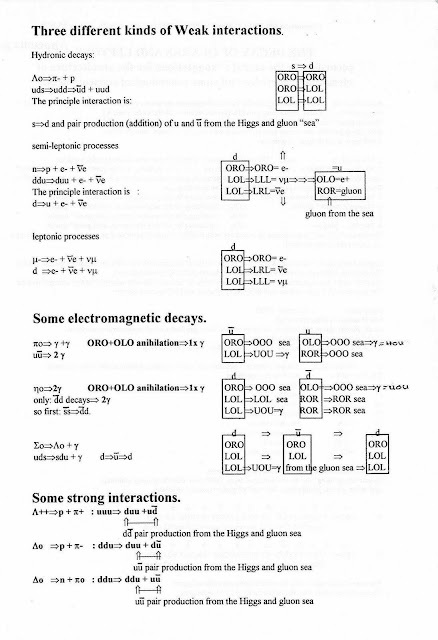 7: The choice between up and down state of the electron. Test proposal. 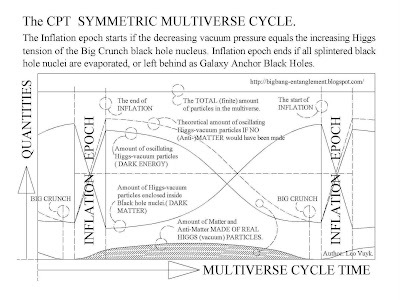 8: The cyclic CPT Symmetric RASPBERRY Multiverse, based on black hole evaporation. Test proposal. 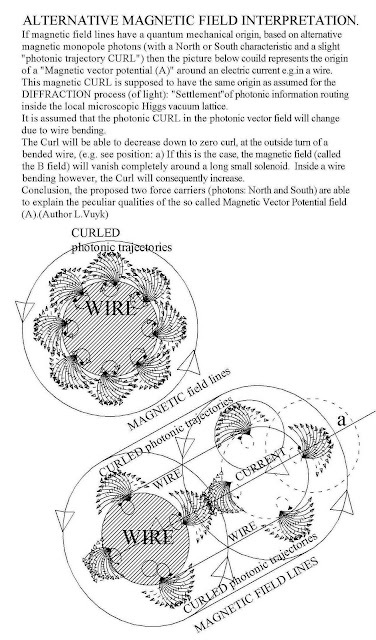 9: Small non primordial Black Holes Should Generate A Ring of Light, but also a ring of IONS AND ELECTRONS! 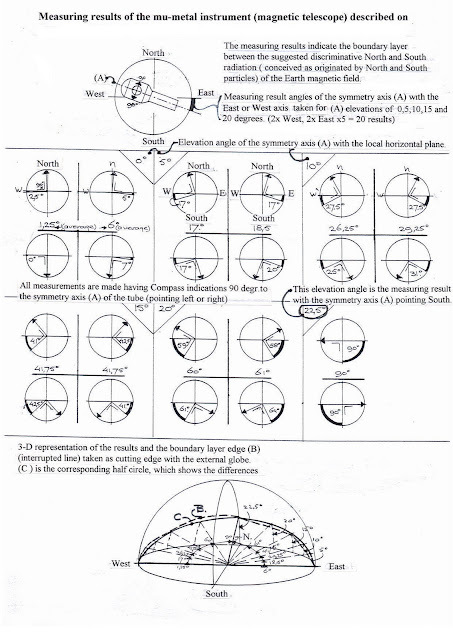 13: Gravity direction dependent lightspeed frame dragging around the earth. Triangular laser test with between two stationary satellites and one ground station. Blog Contents up to 2007. Matter (H2O) creation at the black hole horizon. Hyperion's matter (H2O) creation (by entropy decrease, or Fermion repulsion) at the black hole horizon. 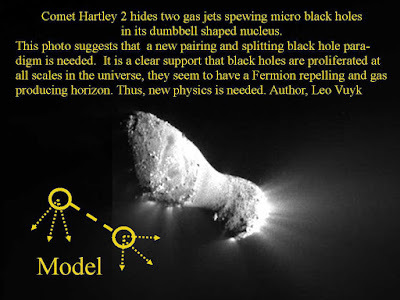 Comet Hartley 2 seems to harbour inside the elongated Nucleus of about 1.5 km, not one but TWO micro black holes, if we look at the two point of radial divergence of the emitted gas jets coming out both end of the Dumbbell shaped nucleus (4 nov.2010). These two micro black hole nuclei are in harmony with my former hypothesis on larger splitting and pairing black holes. 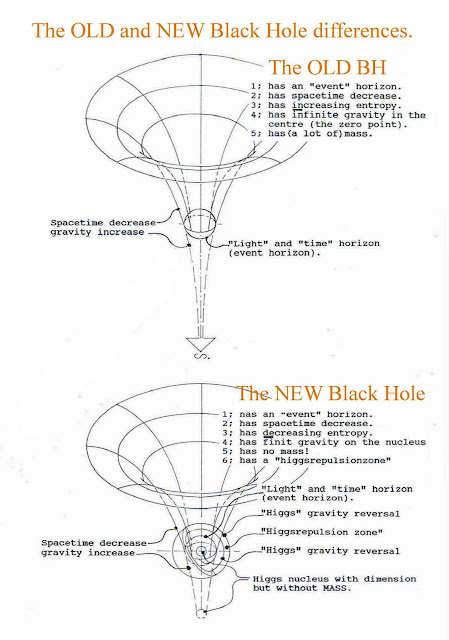 This is a support for my proposal that NEW physics black holes are common at all scales in the universe. down to ball lightnings. 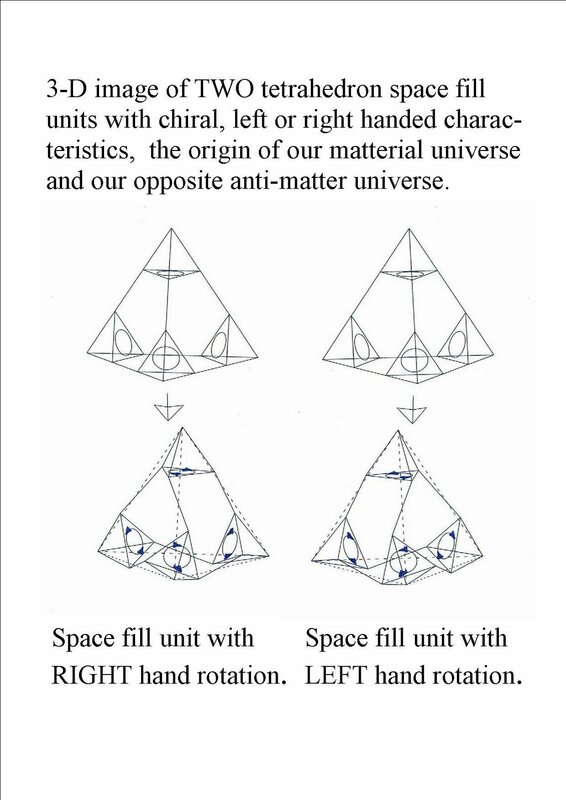 However, if we introduce a point symmetric multiverse, with a raspberry or blackberry shape, then we may say that the positive energy in a material berry -like our universe- is canceled by the negative energy inside the Charge, Parity and Time symmetric anti material opposite berry shaped-universe. Time is there in fact not running backwards their clocks are rotating in the other direction! Electrons are positive charged and left handed systems are right handed, directly entangled down to the the quantum level. 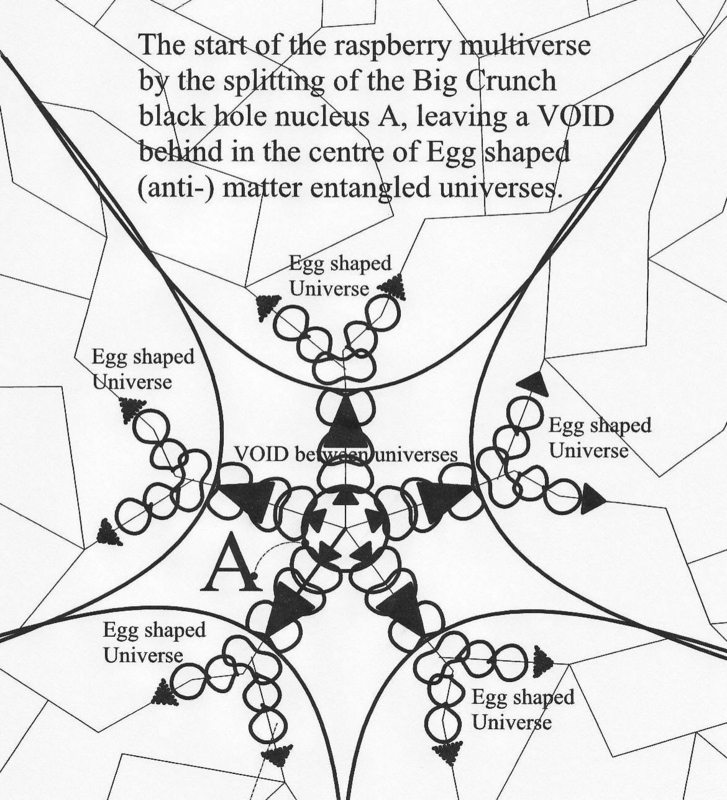 A Grand Design for an entangled 12 fold symmetric multiverse in raspberry shape. 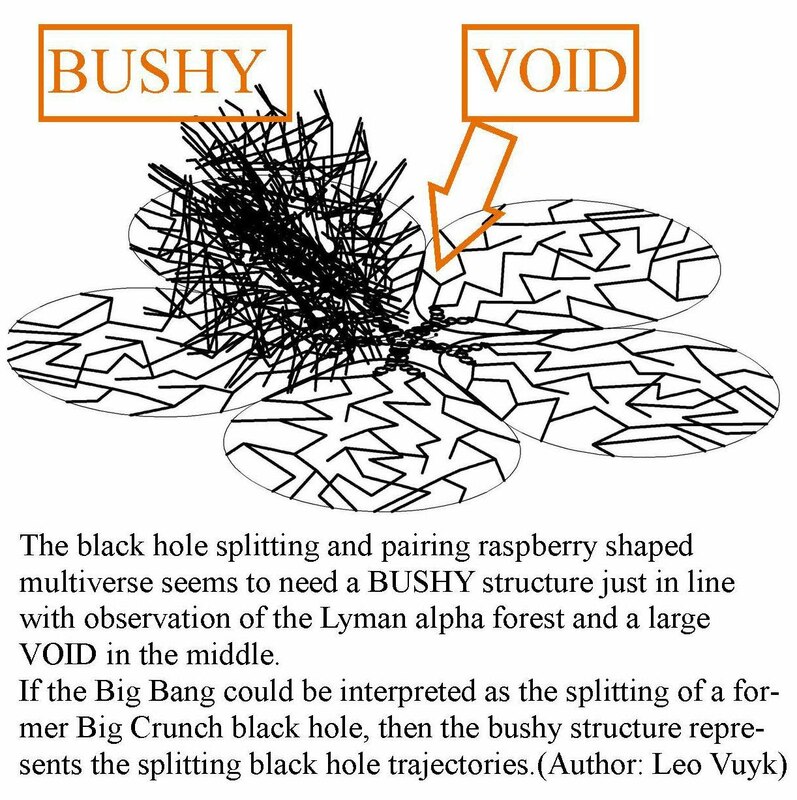 The Raspberry or Blackberry multiverse. What if the LHC finds nothing? "That would be extremely interesting, because if it doesn't find anything, it means the standard model of particle physics is doomed". 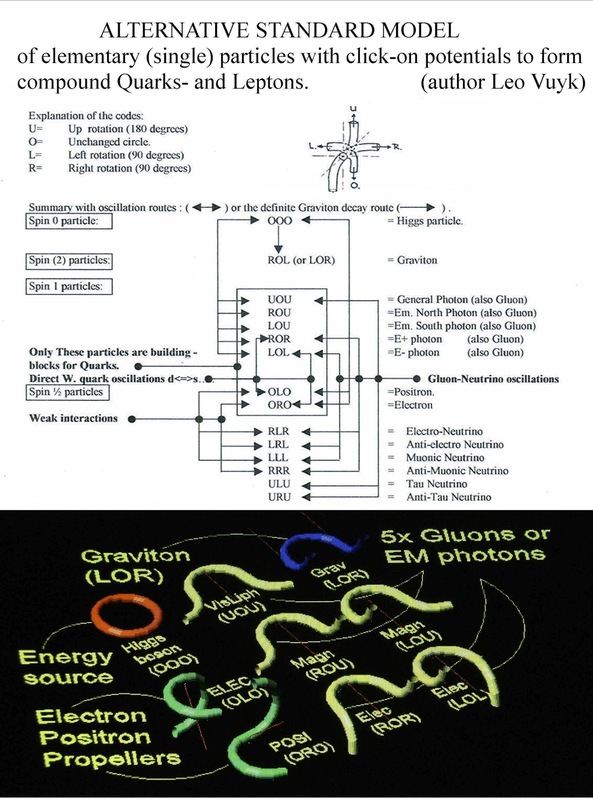 If MASS is the ability of objects to radiate gravitons, then Black holes have no mass because they are supposed to be not able to radiate photons! A new Macroscopic Casimir force, in the form of an socillating Higgs vacuum lattice, will do the gravity job alone around black holes! 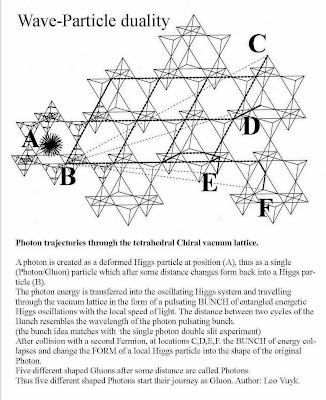 More in detail, according to Quantum FFF theory: Mass is the ability of Fermions to change each massless Higgs particle by collision under specific angles of attack, into a single Graviton. 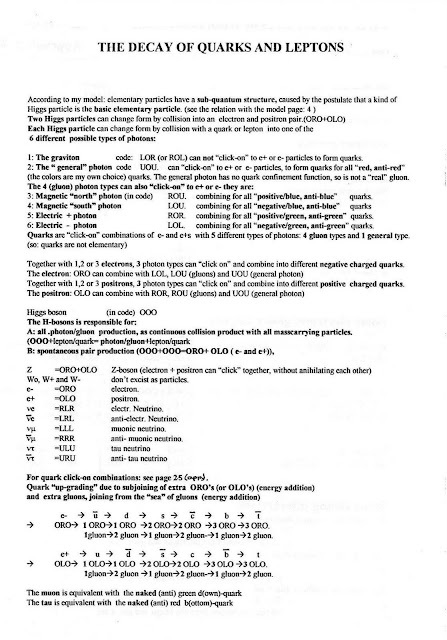 For a suggested new standard model, based on a massless Higgs, but responsible for the mass and graviton radiation of Fermions, see: The shimmering of a new standard model ; one single Virgin Higgs particle seems to be able to transform by collision, into 5 Gluon/Photons , one Graviton, an Electron Positron pair and 6x Neutrinos. If we realize the consequences of the Grand design of a Symmetric and mutual entangled Raspberry shaped Multiverse, as described before, then we need also a grand design at the microscopic level. 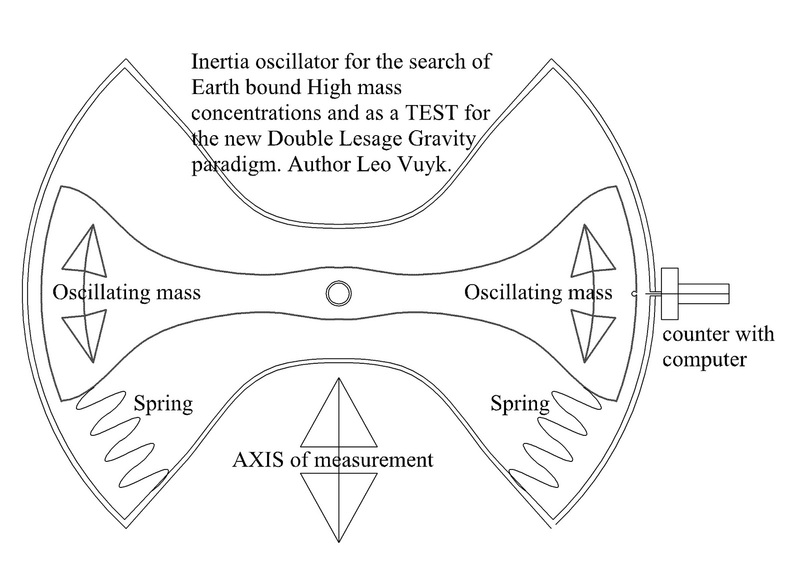 The result is a massless Higgs, massless Black Holes influenced only by a macroscopic Casimir gravity system without gravitons. In contrast with black holes however, masscarrying particles suffer from TWO opposing gravity carriers, the Higgs and the opposing Graviton. 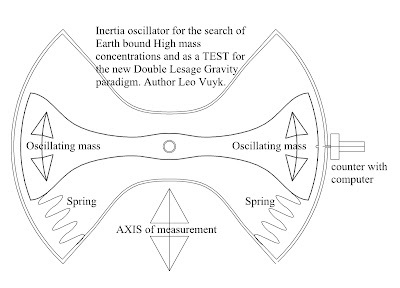 We name this 'Higgs Graviton Gravity" or "Double LeSage pushing gravity". 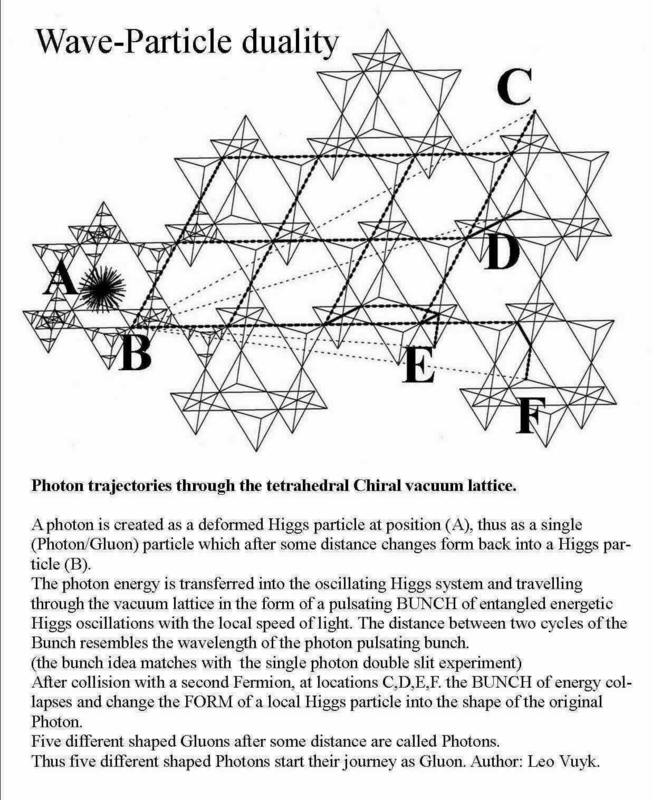 The nature of the Higgs field: Vacuum lattice models and diffraction. 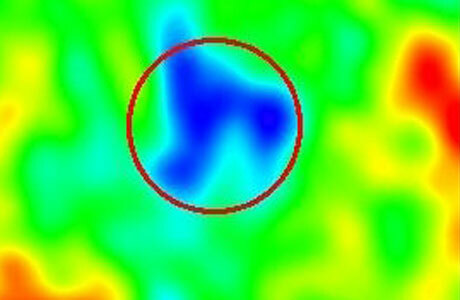 "Standard theories say that matter and antimatter were created in equal amounts after the big bang. 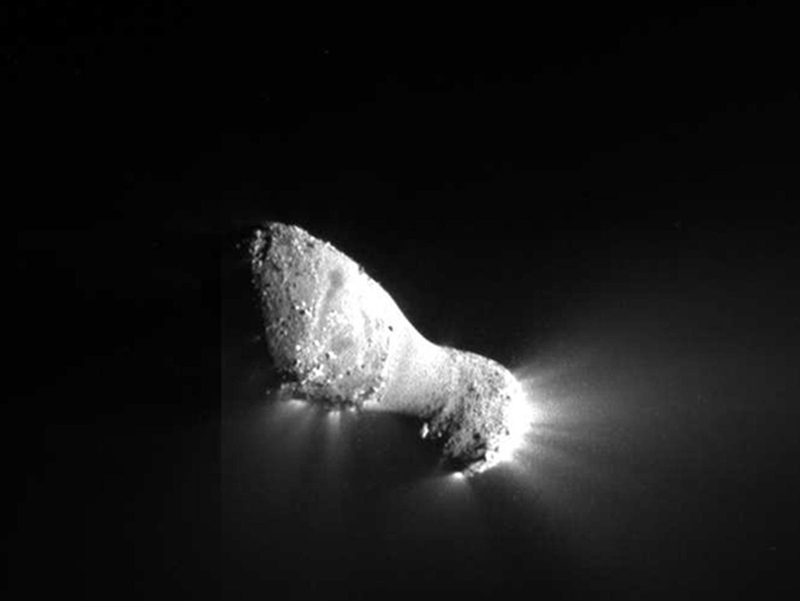 Since the two annihilate each other on contact, generating pairs of high-energy photons, all there should be in today's cosmos is a sea of restless and rather bland radiation. This is not the case. 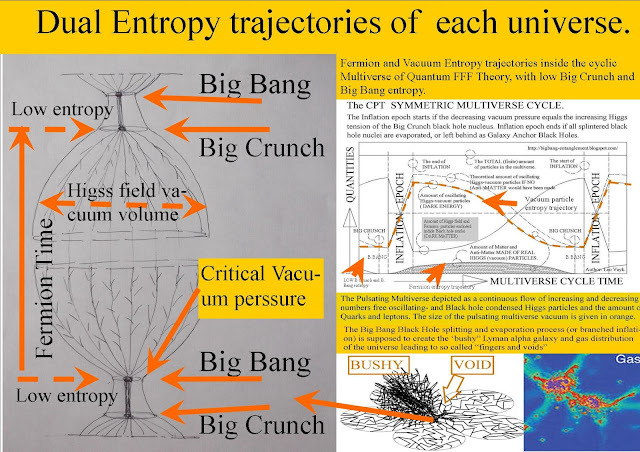 Something seems to have favoured the creation of matter at a crucial moment within the first instants after the big bang." 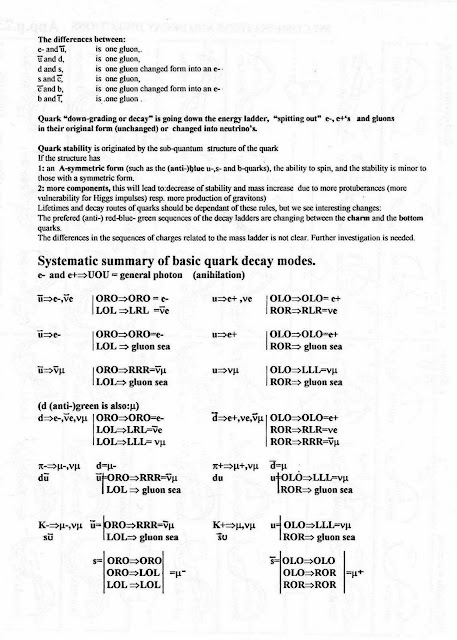 2: the postulate that positrons and electrons can make compound combinations with Gluon/Photons to form Quarks. 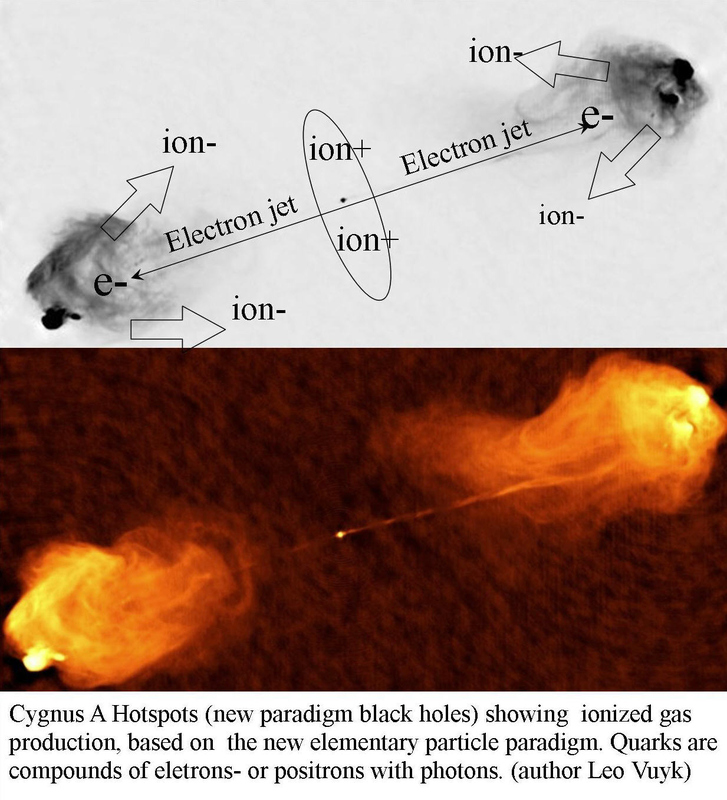 4: The production of Quark Gluon plasma around black hole horizons, by the mutual collision of lensed vacuum Higgs particles. 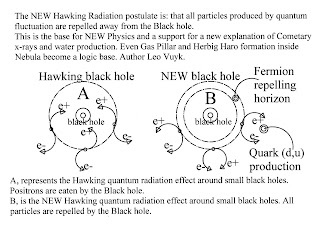 Thus,the black hole will produce only few annihilation effects in combination with Hawking radiation. An example of massless Higgs Casimir pressure in combination with massless Graviton ﻿pressure on a mass carrying quantum particle. The Graviton pressure vector hedgehog acting on a mass carrying quantum, has a globular volume, located at the down side of the quantum. 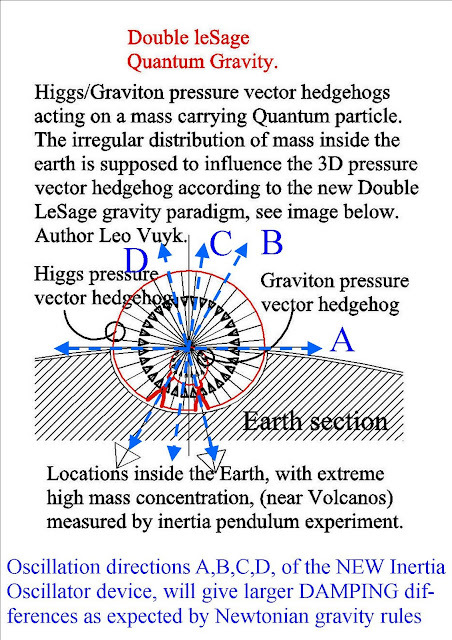 The larger Higgs pressure vector hedgehog is not exactly globular, caused by the postulate that Higgs particles are changed by collision with the earth-mass into Gravitons and as a consequence leave the earth as Graviton. 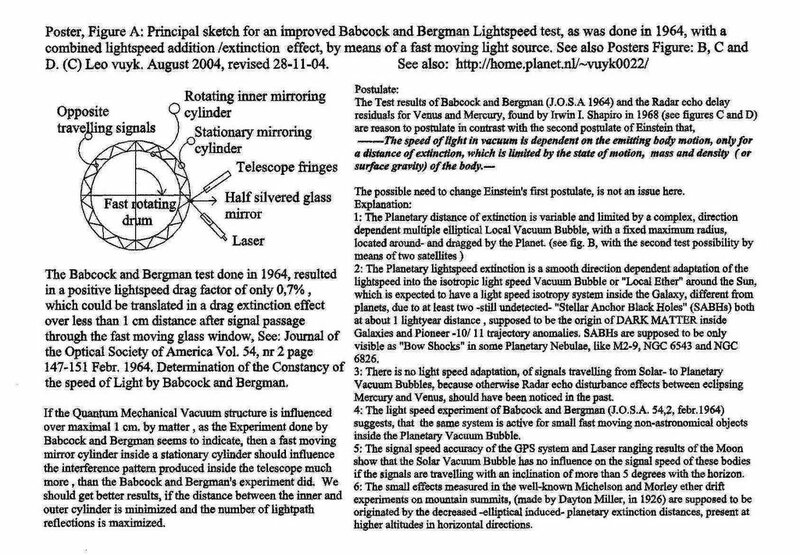 2: Today’s View on the Lesage Hypothesis, by Boris I. Kolesnichenko, Kudrya str., 20, Apt 12, Kiev 01042, Ukraine, Galilean Electrodynamics, Volume 15, No. S1, pp. 15-17. 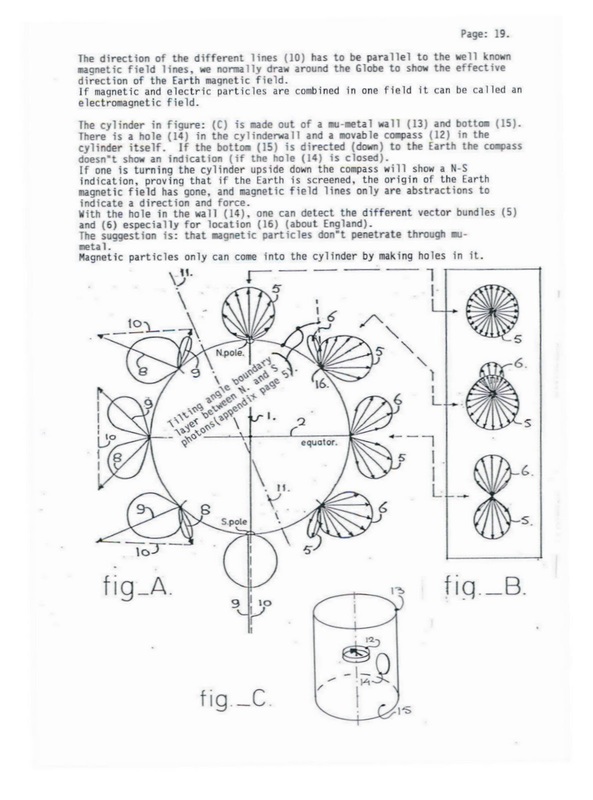 He argues that hard contact collisions between ether corpuscles and elementary particles may turn out to be the common mechanism for phenomena such as radiation, charge, field, wave/particle duality, red shift, etc. Axis of evil is in line with the cold spot!! 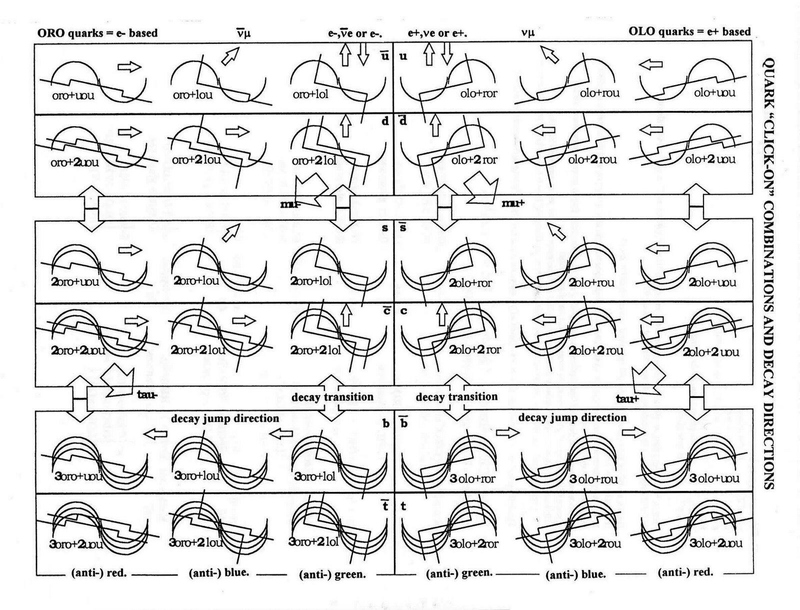 Latest news: 13-10-2010 Newscientist: A cyclic oscillating universe or multiverse is also called "Big Bounce". 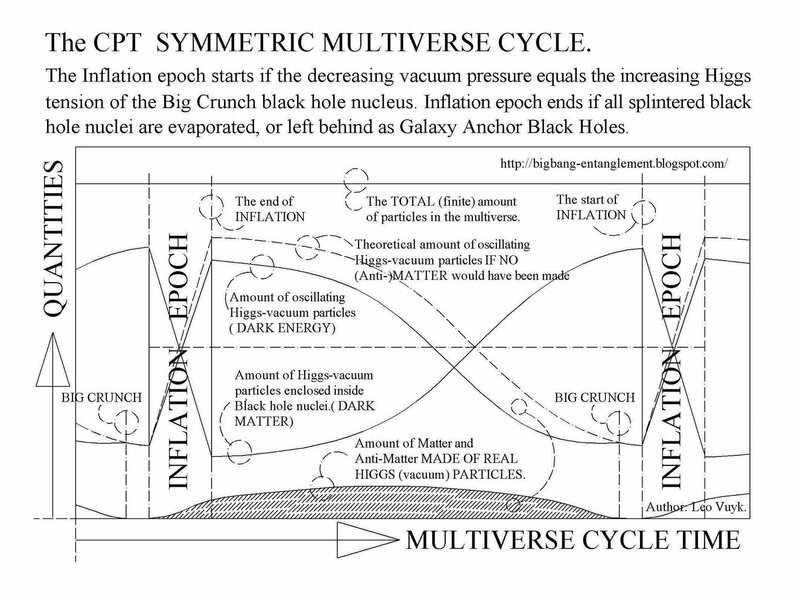 "Big bounce cosmos makes inflation a sure thing"
Stephen Hawking's Grand design is leading to a non symmetric multiverse. 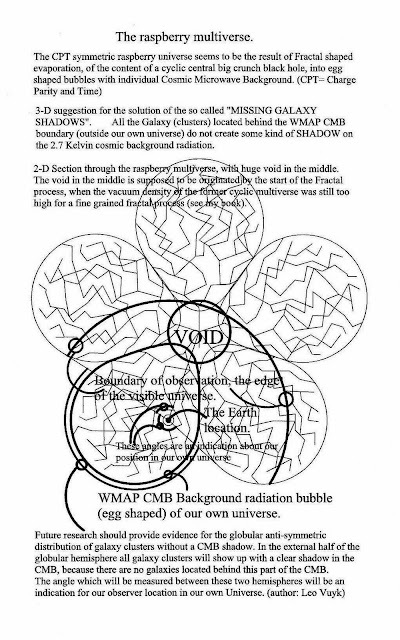 However there is reason to suggest a full symmetric multivers with point symmetry at the centre of a raspberry shaped pulsating bubble multiverse. 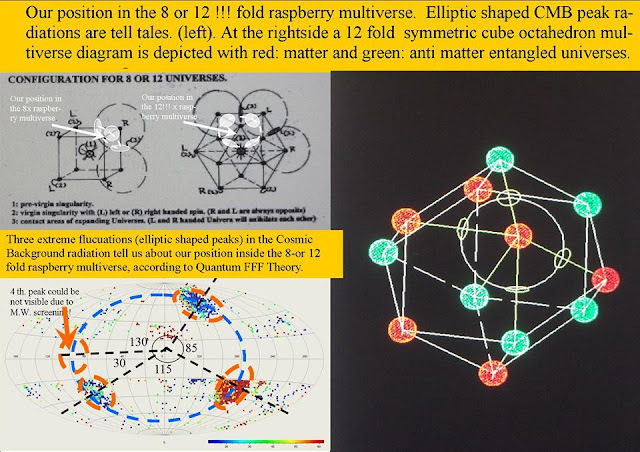 For an entangled multiverse, each quantum should have its own 12 fold entanglement relation to all 12 opposite (anti) quantums, each located inside one of the 12 universes. 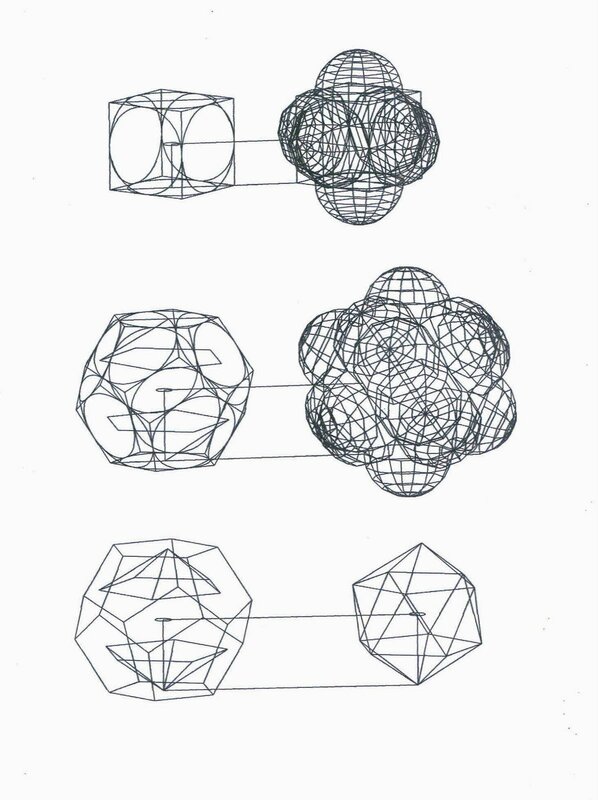 The result is called: Poincaré dodecahedral space symmetry. 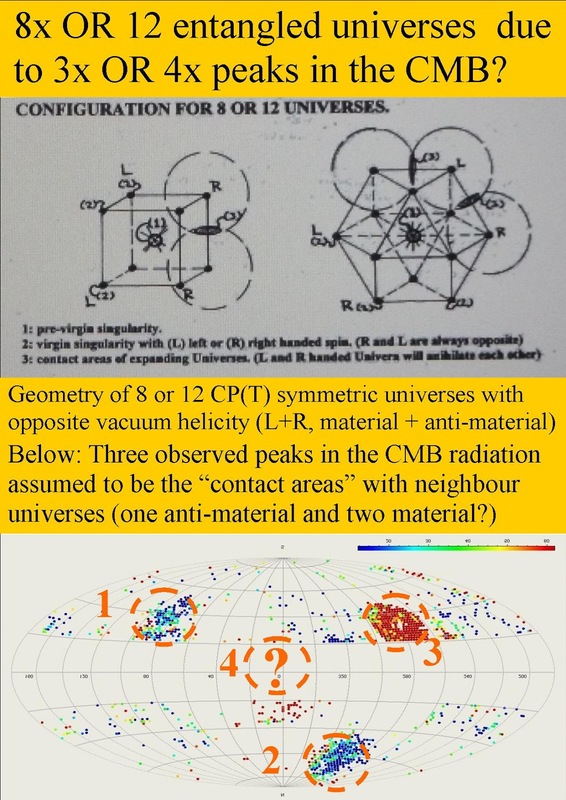 (see also below: B.F.Roukema) A dodecahedron is also called "Buckyball"
An other evidence for space symmetry and the centre of the multiverse is the so called DARK FLOW. Dark flow seems to be found at the edge of the visible universe!! 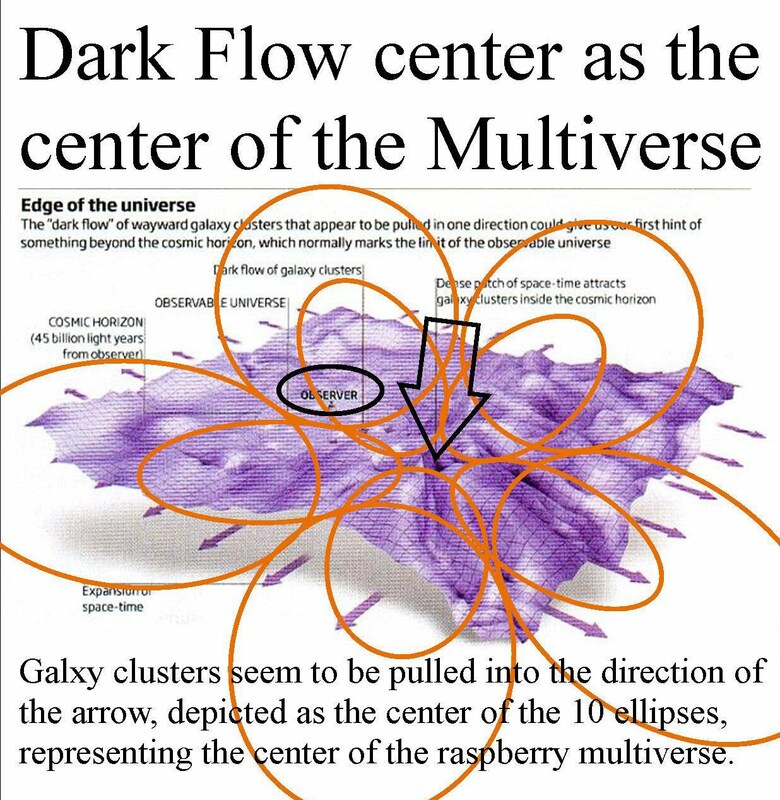 There the "dark flow centre is represented by a so called "Pitch of spacetime"
The radius of the "cold spot" or SUPER VOID, is about 5°; it is centered at the galactic coordinate lII = 207.8°, bII = −56.3° (equatorial: α = 03h 15m 05s, δ = -19° 35′ 02″. Thus it is in the Southern hemisphere of the Celestial sphere, in the direction of the constellation Eridanus. It is Laura Mersini, who called this spot: "a window in the Landscape Universe". 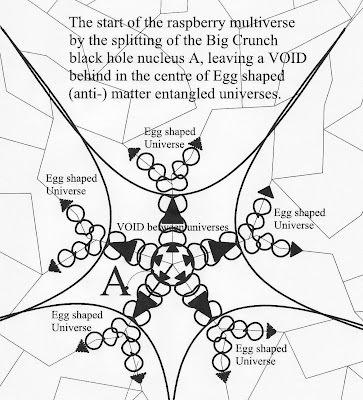 Below we see the start of the Rapberry Multiverse into 12 egg shaped entangled universes, by the splitting of the central Big Crunch black hole into 12 entangled splitting black holes. 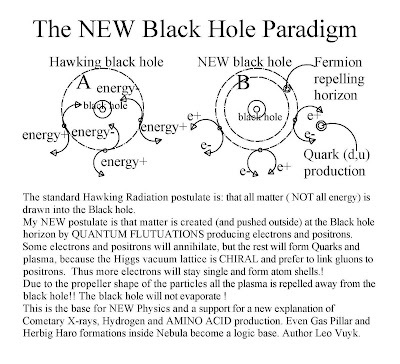 At this location, it is thought that each black hole produces a so called QUARK GLUON PLASMA, this month already suggested to be found inside the LHC at Geneva. 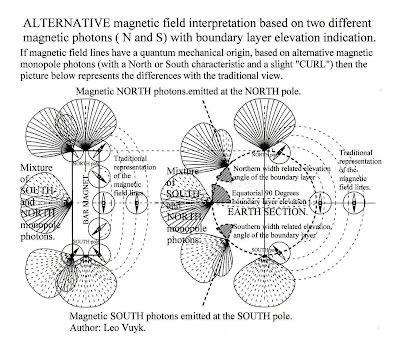 Secondly, there is some proof of primordial magnetic fields in deep space as the logical result of splitting dual black hole systems into electron jet based Herbig Haro objects! 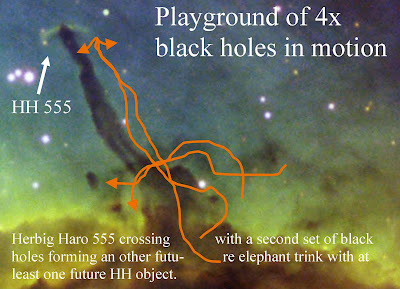 Something SMALL is wrong with physics if we look at the Hubble images of our universe. This and other anomalies are a firm reason (see my former blogs and book) to suggest a PARADIGM SHIFT, which could lead to a TOE. (Theory Of Everything) without the need for an all present GOD who is only good and able to give me shelter. No not such a God, but there is still room for a grand designer and carpenter engineer, who made the shape of elementary particles, who is reponsible for the energetic Higgs oscillations at the Planck scale and Quantum scale entanglement relations between Copy-(anti) Universes as an explanation of the Schroedingers Cat problem, which led to the phenomenon of intelligent life and consciousness! If you look at the next Blog articles, you will find hints for the Goals of intelligent life. I hope that you will be able to grasp the speculative logic of my "Goals of intelligent life" postulation. Why? because: If we don't feed the "have nots" and keep them in endless poverty, the STP-ROM or Global (collective) consciousness around Mother Earth, which is supposed to be the base for all our dreams and intuition, will turn into a steep negative spiral. This could be the origin of a strong global hatred and the rise of fascist leaders. 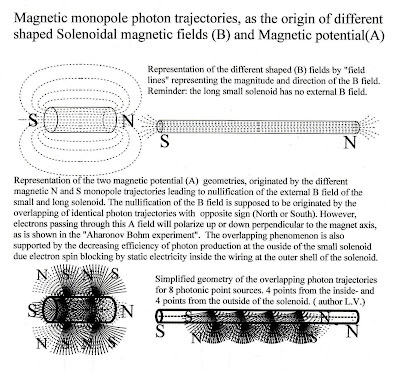 Teilhard de Chardin and Rupert Sheldrake seem to be close to that STP-ROM (Solar Toroidal Programmable- Read Only Memory) principle by their NOOSPHERE respectivily MORPHIC FIELD. Originally the word Noosphere is used by Vladimir Vernadsky, as the third stage of a planet after, the developement of the Geosphere (Inanimate matter) and Biosphere (Animate matter). Conclusion, the Universe is not good or bad from itself, but it give us the opportunity to choose as world society between them for the future of our Earth, by feeding the STP-ROM with all our thoughts and actions as the ROM for the futuere intuitions of others. see above for the Libet tests. Small GR anomalies and test proposals. fractal based by black hole evaporation. 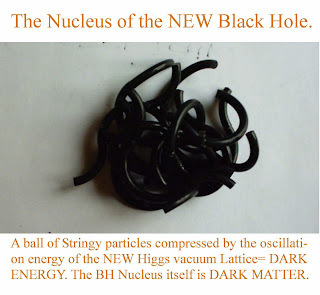 At the inflation epoch, the oscillating Higgs vacuum lattice is formed by BH evaporation inside 12 small but expanding (anti) universes in raspberry shape. As a result, the length of the tetrahedron lattices where shorter than now. 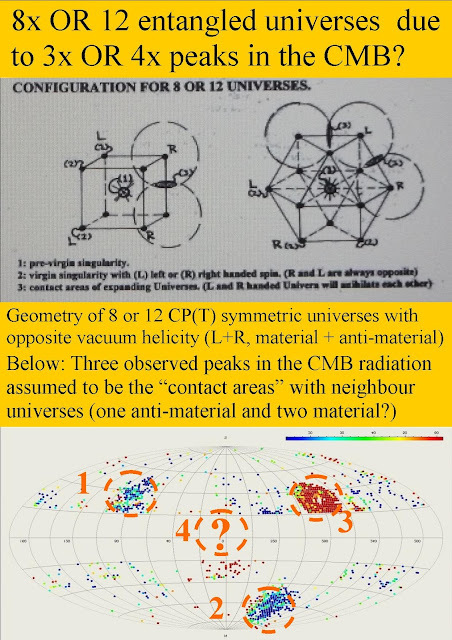 See also: speed differences related to the CMB frame, found in the universe: "The peculiar velocity field: constraining the tilt of the Universe"
1: our position is not located in the middle of out universal bubble. 2: the Universal bubble could be contracting, also if we assume that the Hubble redshift is partly originated by the general space absorption by the proliferated Dark matter black holes. 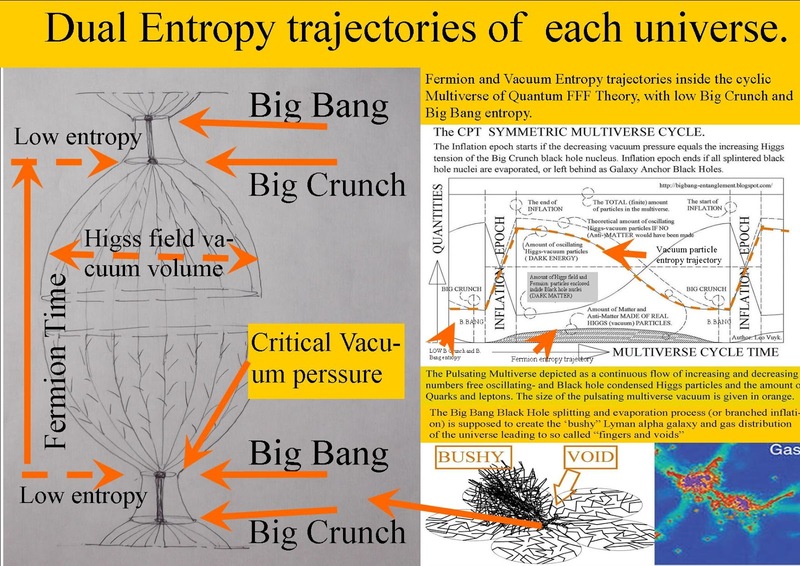 3: there should be real doubt about the accelerating universe idea. 3D view on symmetrical cubic or dodecahedron multiverses in raspberry shape. Only a few particles are compressed together by the Higgs vacuum pressure, inside the nucleus of a micro black hole. 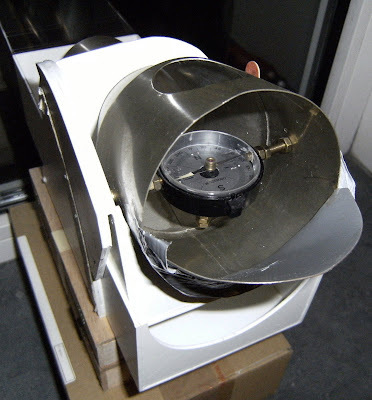 No matter or anti matter is supposed to survive the BCBH and even no information inside the STP-ROM vacuum. 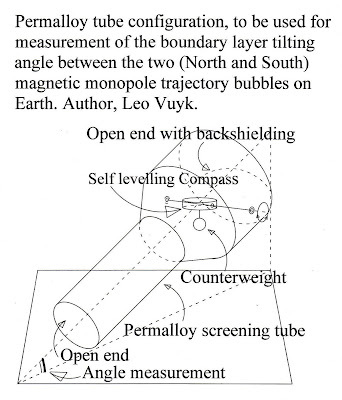 Leo Vuyk is a retired building engineer (architect) and independent researcher in Theoretical Physics and Cosmology.